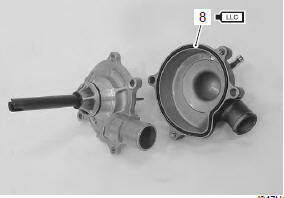 Refer to “water pump removal and installation” . Remove the air bleeder bolt (1) if necessary. Remove the water pump case screws. 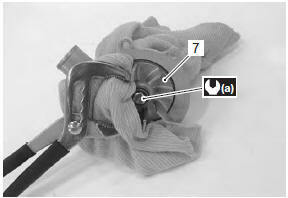 Hold the impeller (3) with water pump pliers and remove the impeller securing bolt (4). 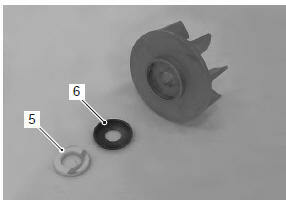 Remove the mechanical seal ring (5) and rubber seal (6) from the impeller. 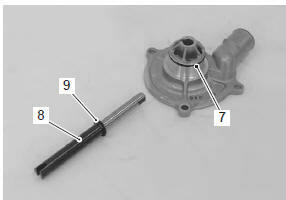 Remove the o-ring (7), impeller shaft (8) and washer (9) from the holder. Remove the mechanical seal (10) with the special tool. if there is no abnormal condition, the mechanical seal removal is not necessary. 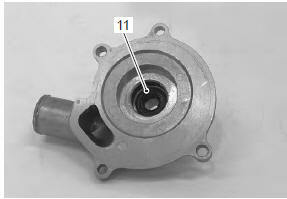 Remove the oil seal (11). if there is no abnormal condition, the oil seal removal is not necessary. the removed oil seal must be replaced with a new one. the stamped mark on the oil seal should face mechanical seal side. Apply a small quantity of the grease to the oil seal lip. Install a new mechanical seal using a suitable size socket wrench. the removed mechanical seal must be replaced with a new one. on new mechanical seals, the sealer “a” has been applied. 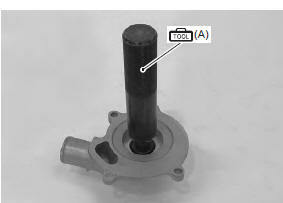 Apply molybdenum solution to the impeller shaft (1) and washer (2). 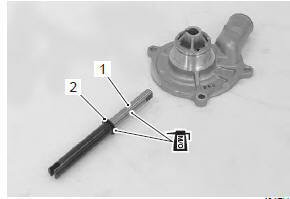 Install the impeller shaft (1) and washer (2) to the holder. Install the rubber seal (3) into the impeller. 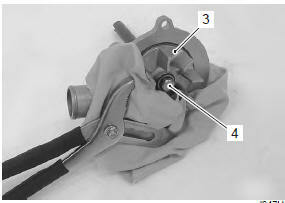 After wiping off the oily or greasy matter from the mechanical seal ring (4), install it into the impeller. 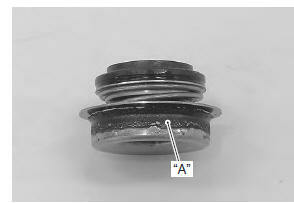 the paint marked side “b” of mechanical seal ring faces the rubber seal. 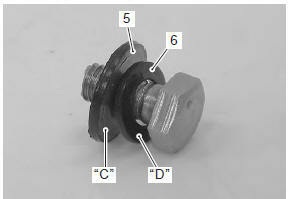 Install the washer (5) and seal washer (6) onto the impeller securing bolt. 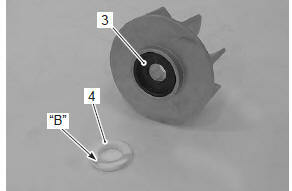 the metal side “c” of seal washer and the curved side “d” of washer face the impeller securing bolt head. 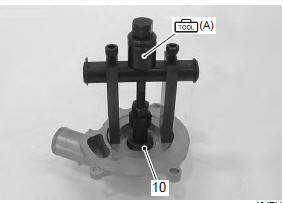 Hold the impeller with water pump pliers and tighten the impeller securing bolt to the specified torque. Install new o-ring (8) and apply engine coolant to it. use a new o-ring to prevent engine coolant leakage. 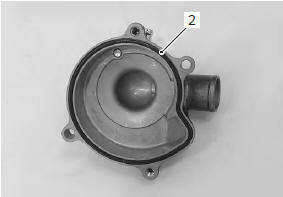 Tighten the water pump case screws to the specified torque. 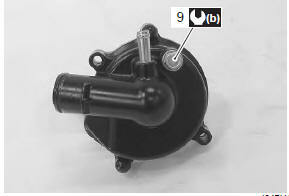 Tighten the water pump air bleeder bolt (9) to the specified torque. use a new gasket washer to prevent engine coolant leakage.